A beautiful morning indeed. After weeks of much rainy weather this morning was clear and dry and calm! 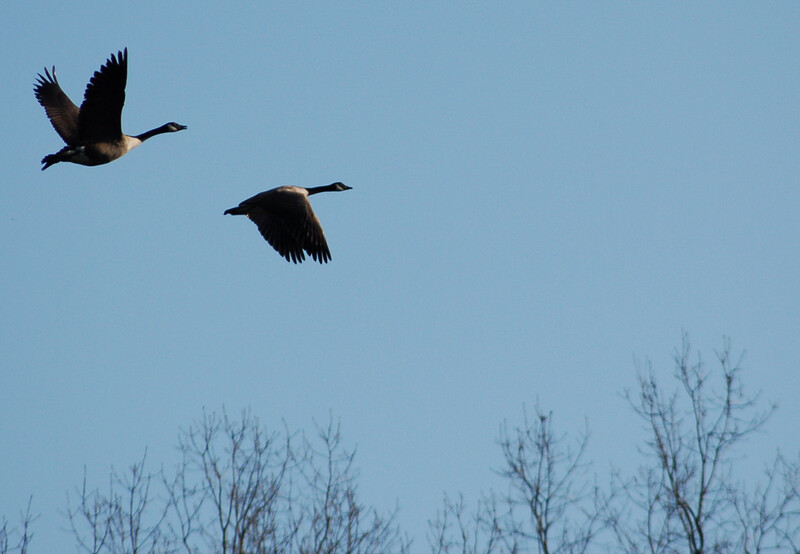 I sounded off with a goose call and heard an answer. My step father, Bob Miller and I set up hoping the gobbler was not across a rural road behind an eight-foot enclosure. 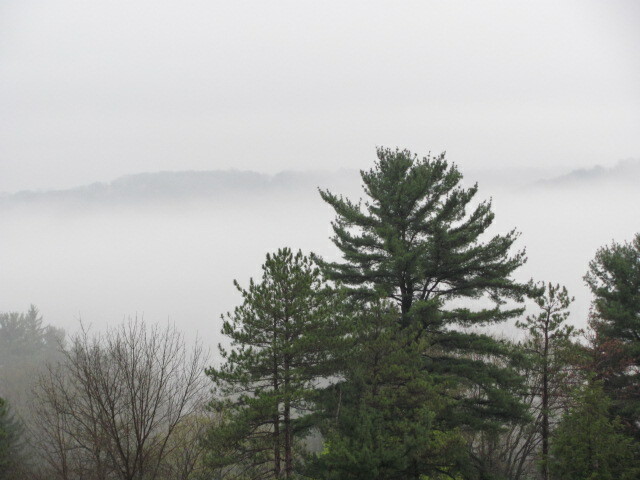 I called sparingly hoping the big bird would fly to our side of the hill. he didn’t. he worked towards a trailer and two booms were heard. I had heard two distant gobbles and we headed in that direction when I heard hen talk. We paused and I correctly surmised the calling was human. We turned away and went several hundred yards when three shots from two different guns blasted away. We heard and saw a turkey flying away in the distance. Bob and I crossed the road where we had parked and heard more hen talk followed by two blasts. 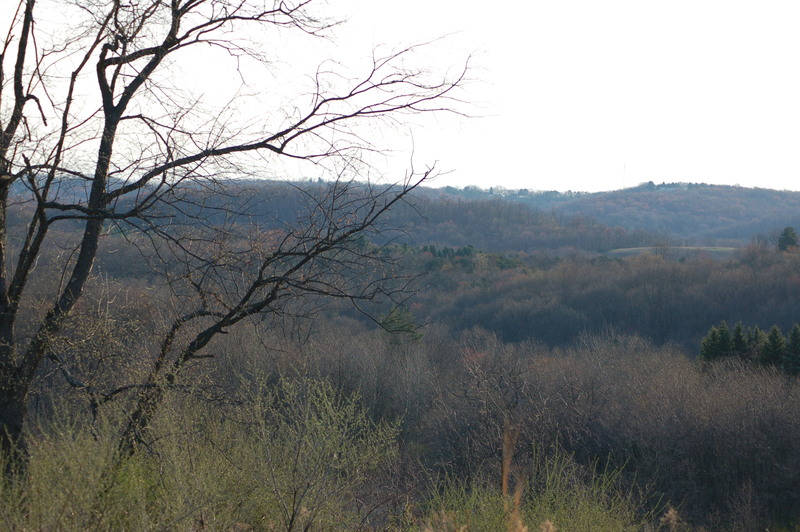 We went high on the hill to check a field and heard two more shots over in the next hollow. I did see a hen in the field. Bob decided to leave the woods and travel to Ohio to mow the grass at his other home. I went to another place. I heard a hunter and avoided the area and was answered by a single gobble. I began a trek down over and up over the next hill when I heard a shot. 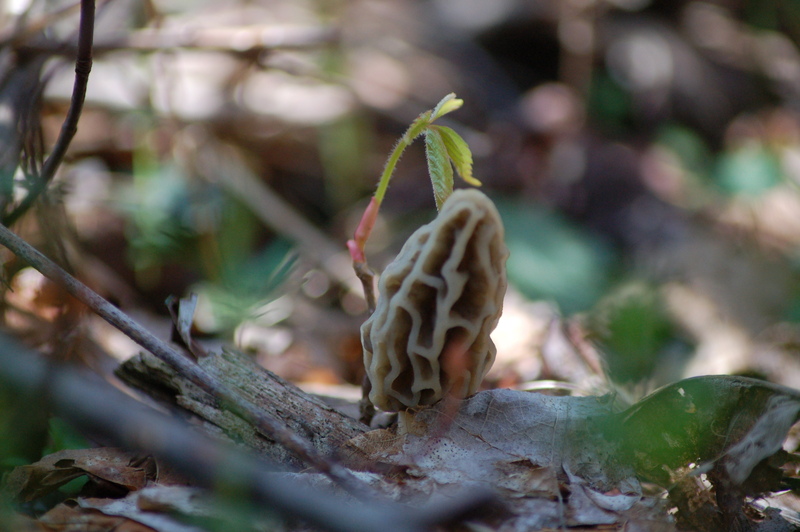 I decided to hunt morels and work for turkeys next week! I found some morels..yum- yum! I saw several squirrels and six deer today too. I do not function in high-hunted pressure areas. 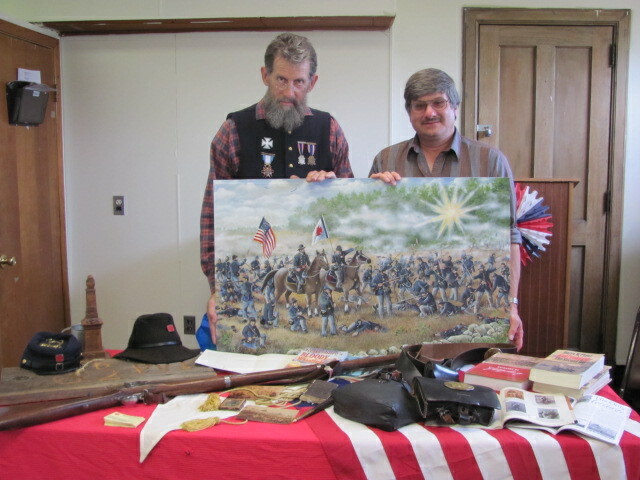 I needed to leave early anyway for I was to meet my friend Slim Bowser to do a joint Civil war presentation. Slim, dressed in Civil war era soldier clothing, and I visited the Worthington Library. This year is the 150th anniversary of the beginning of the Civil War. Yes, that is only three 50 year life spans. Slim set up a display of Civil war items of interest. I set up my, yet uncompleted, painting of the Rose Wheatfield Battle of Gettysburg. I brought early sketches and such to discuss to those in attendance. Slim did his talks basically, on the 62nd, Company D soldiers. Many of these soldiers had enlisted during the war from our area of Armstrong County, Pennsylvania. The visitors throughly enjoyed the educational and informative talks. 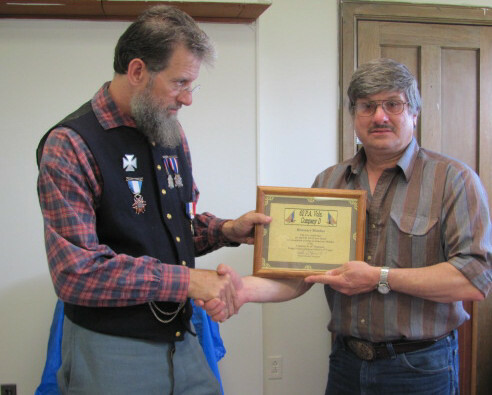 At the completion of our presentation, I was deeply honored to receive an honorary membership of the Company D, 62nd regiment Pennsylvania Volunteer Infantry, 5th Corps. Sometime I wish to do a blog concerning my ancestors who fought in the Civil war. At least, six out of a family of 15 were in that war. Two died in battle. My great Grandfather was wounded. One seems to have died from typhoid. Oh well, that is a story of the future. 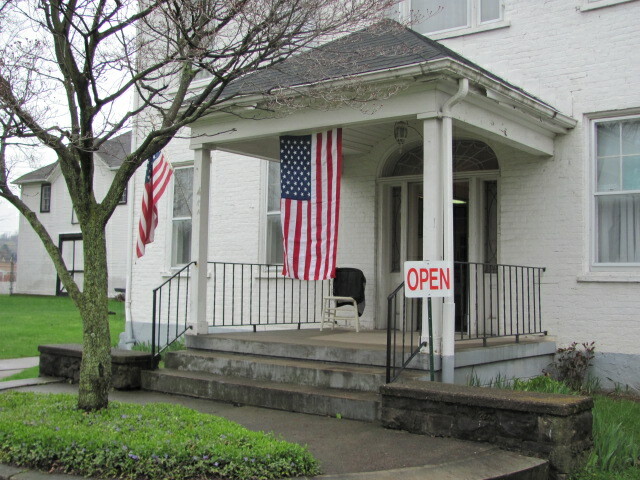 The Armstrong County Historical Museum opened for the 2011 season on Saturday, April 23rd, 2011. Concerns over predicted rainy weather were unfounded since rain was absent on the day and sun with warning weather proved to be a pleasant surprise. The upstairs rooms, known as the Military Room; Sewing Room and Native American Room were opened after much work over the months. The Military Room has suffered water damage and repairs to the problems should soon be accomplished. Ron Crytzer has repaired damaged walls twice over the last six months and damage has occurred again. 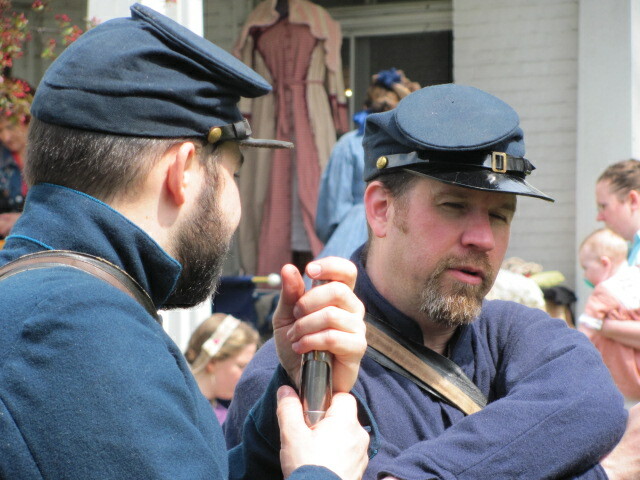 The opening of the museum was met with a number of visitors throughout the day.Volenteers were on hand, most in Civil War era clothing to answer questions. An added plus for the event were members of the John T. Crawford Camp 43 and Sarah A. Crawford Auxillary. 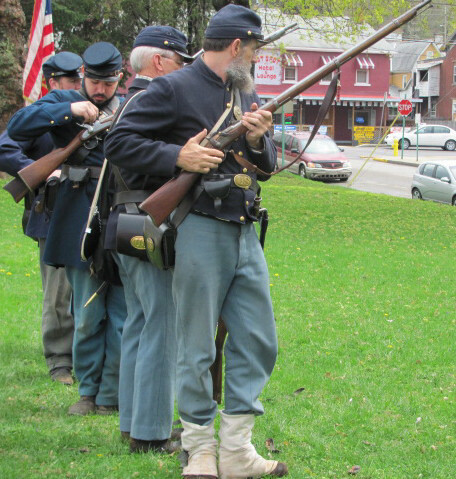 These dedicated reenactors and historians set up several tents and various weaponry and other items from the Civil War era. Loading and shooting demonstrations were, also, completed for interested visitors. 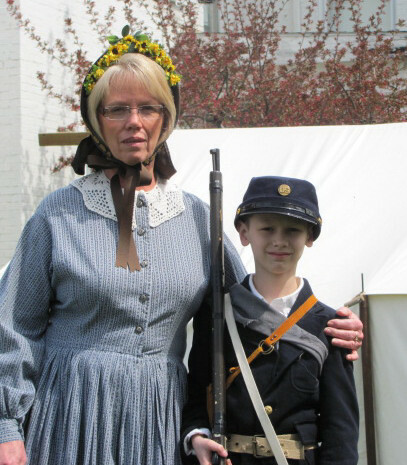 One young fellow dressed with Civil War attire was standing on the porch early . I approached him and gave him an order to guard this entrance. After some light corrections due to his wandering eyes he stood at attention. I was called away for a few tasks and returned about twenty minutes later and was surprised to see this young man still there. i relieved him of his duties at that time with a smile. After Bob and I ate a hearty breakfast, we left Susie (my springer spaniel) and mom to fend for themselves at home. We entered the woods after 9:00 to study the Cherry Run area for turkey signs and whatever else we could observe. 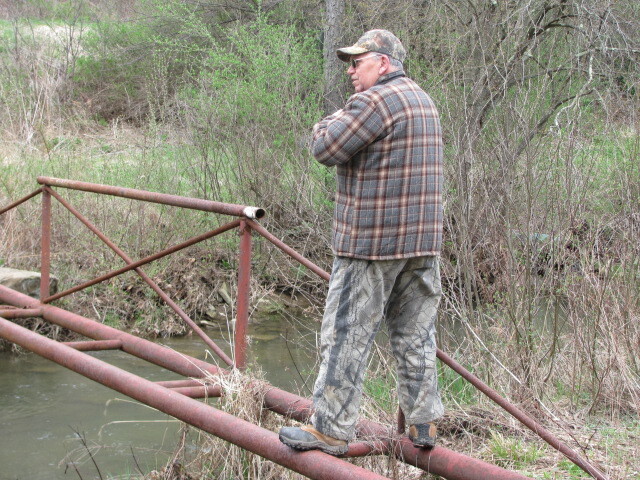 The first obstacle we encountered was crossing the gas line bridge. the wood planks have been long gone especially from Hurricane Ivan, but two pipes still exist. Bob, at 76, does very well except when I torment him. This was to be another torment. He was about half way across these pipes and I accidentally began to shake the bridge. (accidents do happen) I expressed my sorrow with a smile. We discovered some turkey sign at the two places we walked. 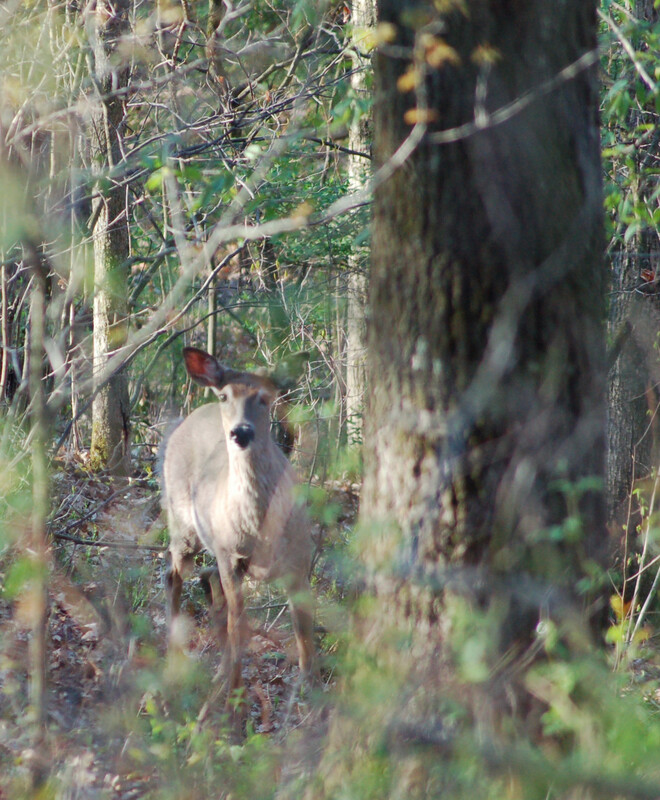 We saw nine deer; two squirrels; pileated woodpecker; two hens and a gobbler. We heard some yelping father along, but back, in the woods. The honeysuckle and multiflora rose are already greened out. The other trees are always slower. As the trek continued I noticed a small gray-colored mass among the forest floor. The mass had obvious bones in it. This is owl regurgitation. 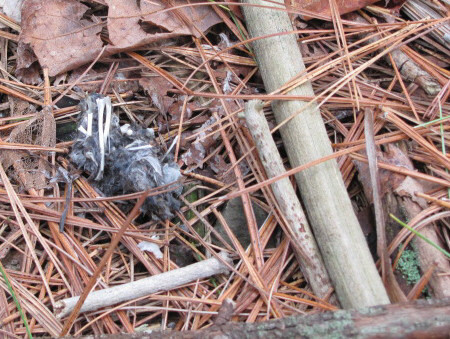 Owls eat their prey whole and their digestive system push out hair, feathers and bones into an “owl pellet.” Study of a pellet can realize the victim at many times. Other things of interest, at least to me is the plant life. Today, I found delicate spring flowers known as the rue anemone and others known as Dutchmen’s Breeches. 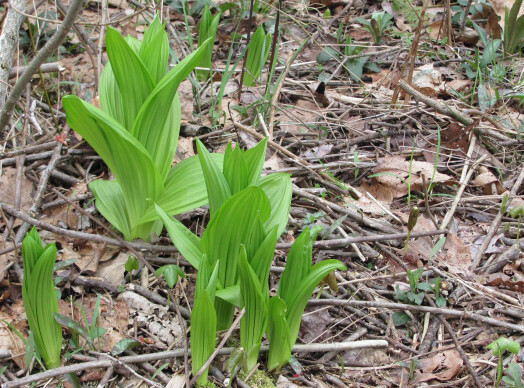 Another plant I like if the false hellebore. This plant has a tropical look once it matures. 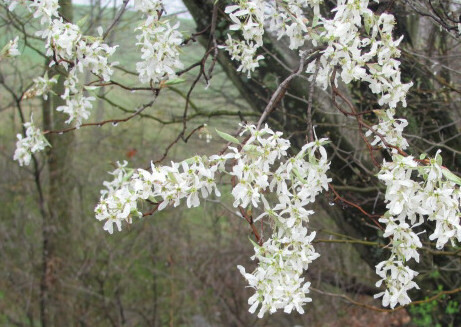 They grow and flourish along streams and wetlands. I have planted this plant on my property. However, come summer they have completed their annual cycle and begin to turn brown and fade off the scene until next spring. Unfortunately, we observed some things that are negative. Why people feel a need to abuse other lands has always forced me to wonder. Beer cans are often viewed along farmer’s lanes and gas well roads. Today was no different. We looked into the winter wheat fields and it was easy to see the doughnut tracks caused by ATV and other 4-wheel drives. No wonder the farmer posted his land. I have always been a self-thinker with many things. Many years ago while in my late teens to mid-twenties, I first asked myself the question as to how a Good Friday crucifixion could be three days and three nights leading to the resurrection. You noticed I stated here that I asked myself. I didn’t dare ask a trained pastor or priest this question. I figured in my mind that a probable reason is known to the trained individuals and left the thoughts wander off. However, at times these thoughts would resurface. I discovered an explanation once that the Jews considered even one hour of a day as an entire day. So, a few hours of Friday evening, all day Saturday and and hour into Sunday would make this three day-three night promise fullfilled. I didn’t buy it! I kept my thoughts privately, until a dozen years or so, I discussed it and received looks of confusion. I wrote these thoughts down and kept them. I believe that the Good Friday concept happened somewhere way back among some church leaders who didn’t take into account Jewish laws and ways of counting days and nights and their different sabbaths. The tradition has flourished over the years. In John 19:31, it is stated, Since it was the day of Preparation, in order to prevent the bodies from remaining on the cross on the Sabbath for that day was a high Sabbath… (Jewish sabbaths begin at sunset and go through the following day until sunset again). This high sabbath spoken in John can occur any day of the week and is referred to as one of the “annual Sabbaths”. This particular one occurred during the Feast of Unleavened Bread known as “Chag Hamatzah”. This is over the Passover week. So Jesus’ body would need to be entombed before sunset under Jewish law. We know from scripture the women went to the tomb very early on the 1st day of the week which is a Sunday. To allow for the 3 days and 3 nights as told by Jesus Himself the High sabbath would need to be on Thursday of that year with a Wednesday afternoon crucifixion. By writing the days and nights down, I found it easier to follow. Jesus, to fulfill His own promise would have been resurrected anytime after the Saturday’s sabbath ended at sunset. I beautiful and pleasant day was on hand and some outdoor related events needed to be part of this day. 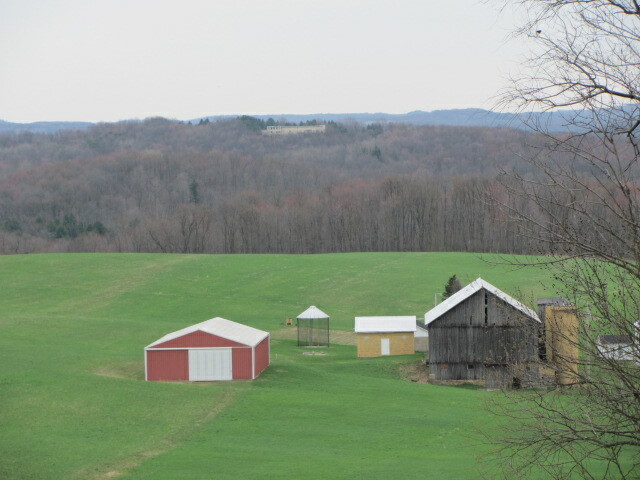 I elected to visit State Lands 247 near Center Hill, Pennsylvania. The object was to enjoy a walk and see some critters. I purposely drove in to the game lands via a different route. I figured I might see my friend Frank Maus along the way. I did! Unfortunately, I couldn’t chat long since I was located along some bad curves on the road. We bid a see ya and both went separate ways. My walk wasn’t long before I began hearing some gobbling turkeys. I decided I was hearing, at least, three birds. 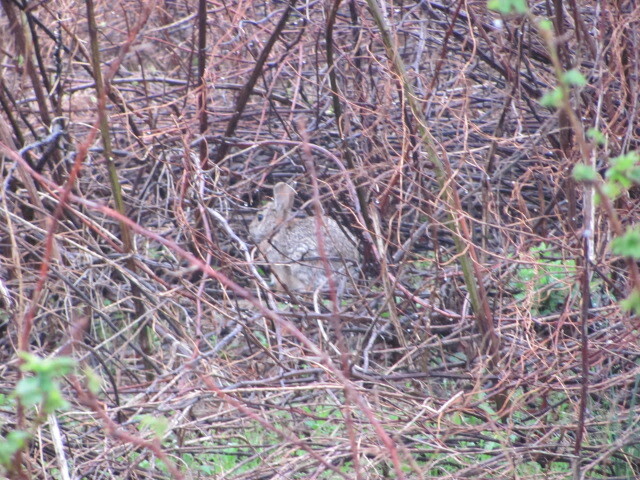 Later I saw a gobbler along a trail. 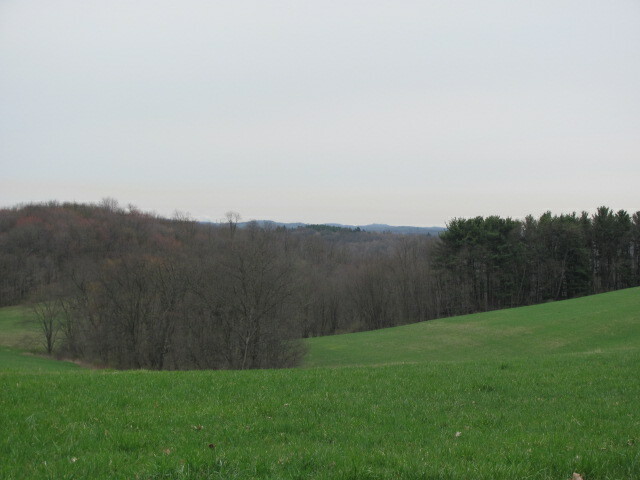 The hike continued along until I heard another gobbler about 100 yards from me. I stepped among some brush and let out three soft yelps. Several gobbles later then silence. 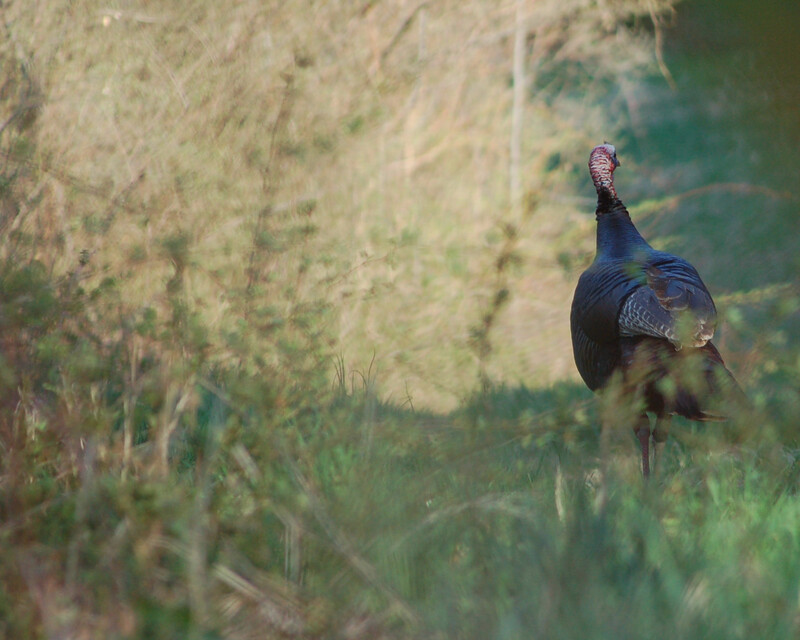 A few minutes on I could see the gobbler working towards me. I managed about six photos. 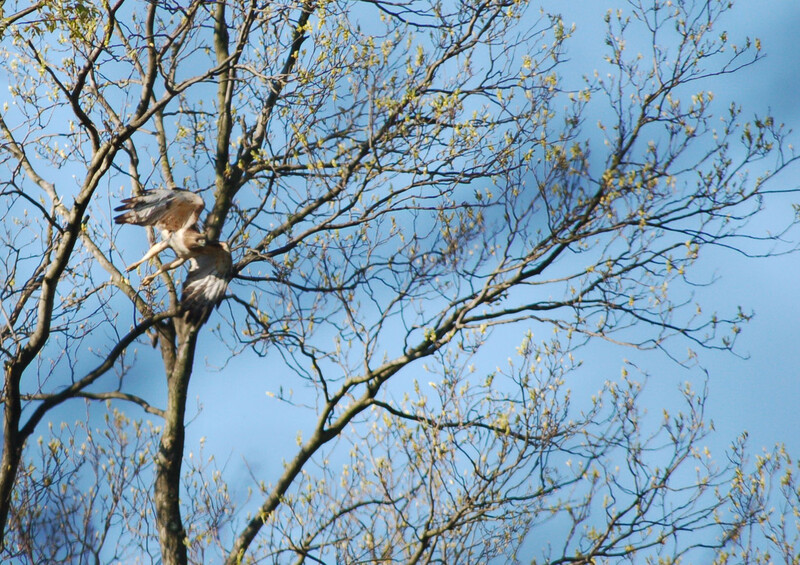 Unfortunately, most were blurred some due to the bird’s movements and close vegetation that caused hazy images. 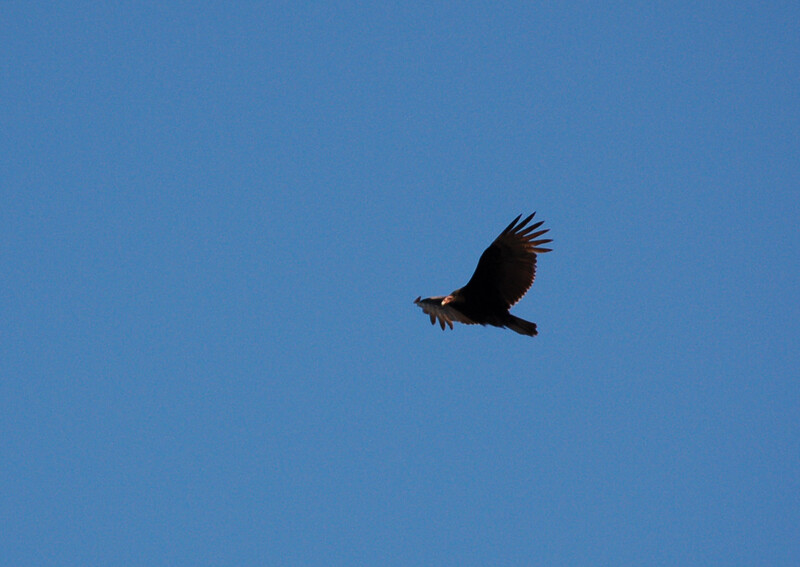 Eight turkey vultures circled me for about 40 minutes this morning. I surmised they were hoping I would fall over to supply them with some fresh carrion. I fooled them by not succumbing to their desires. Several soared over me while at the house planting too. I wonder if they know something about me that should concern me. Other critters of the day included a grouse drumming on his log. I saw one deer; some geese; a pileated woodpecker; a fox squirrel and a grey squirrel. 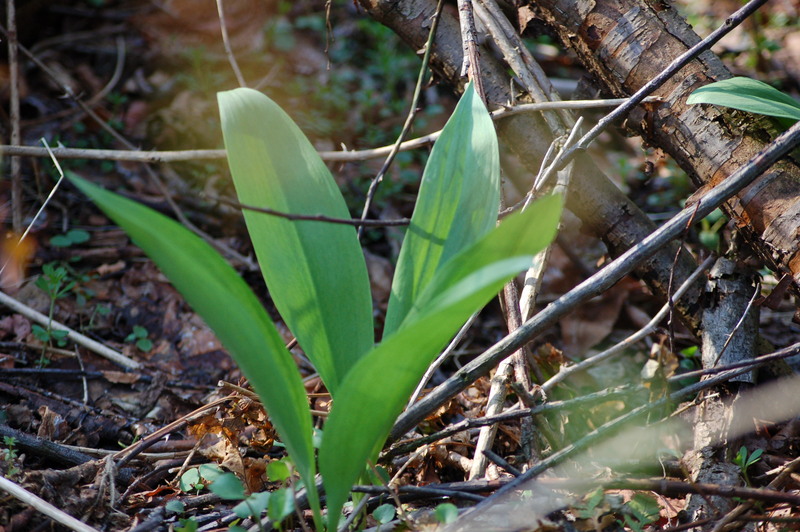 I found some wild leek. I think I may have started this planting of leeks many years ago by planting some seeds. I would carry seeds from my personal supply at home. 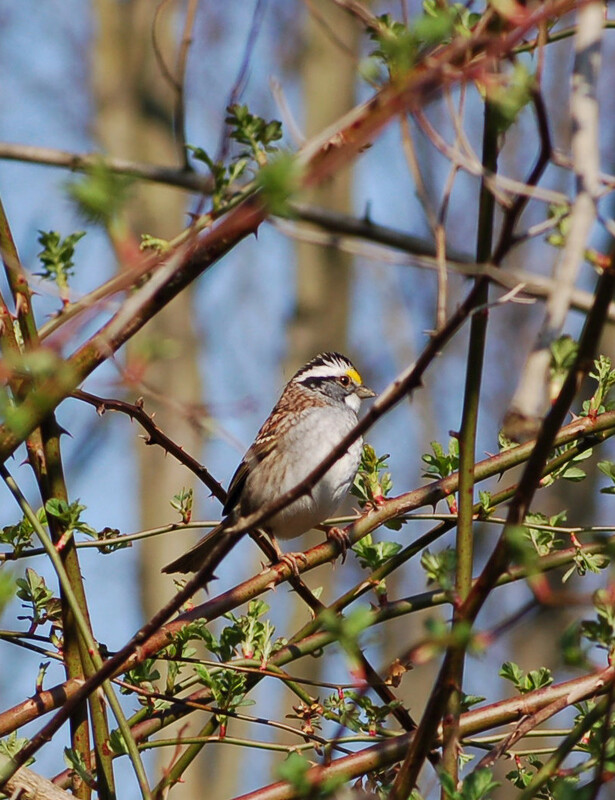 Another first for the season was the white throated sparrow. Quite a handsome little fellow. Later, I stopped at a friend’s to ask permission to dig up a few white birch trees to replant at my home. We chatted a bit and an hour later I was planting trees among my landscaping.